It's been a whirlwind 2 weeks. I got back from Paducah last Friday. After sleeping 12 hours a night for a couple days, I am beginning to feel half-human again, and interested in working! I went with my mom and 9 yr old daughter. Sophie has always been great to travel with, but until this year we never shared a bed other than a king (so I never got to fully experience her ability to keep me awake!). She's such a good traveler, taking every person and quilt in stride. I really don't look forward to the year she tells me she doesn't want to go. I am still amused of one particular story. On Thursday afternoon I slipped away for a 1-1/2hr class. Sophie and my mom wandered in town, going to shops. They apparently went into one store where the shop owner (whom I do not know who was) knew Sophie by name! My husband jokes that when he comes to Paducah he wants someone to refer to him as Sophie's dad. Apparently she is known in this circle of life! While in Paducah, I got to rummage in too many antique stores. There are many, but the last one I wandered into was the jackpot. I just love the antique linens. I managed to find (ahem, cough, choke!) quite a few. Rest assured, though, I do have a plan! I cut away the silk from beneath the linen so it did not show through. It was mounted on my DSM, trimmed, then immediately loaded on the longarm. 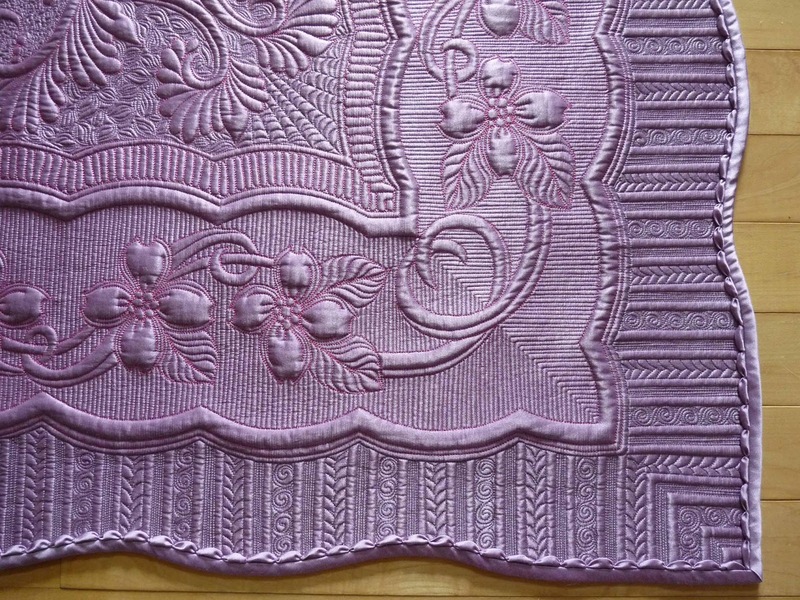 It is quilted with several threads - major motifs are in a golden YLI polished poly, while dense and outline stitching is with 100 wt silk and invisifil. With trepidation, I did mark this with purple pens. You never know if older embroidery thread is going to be color-safe, but I spritzed it with water anyway. All was fine. I will enter into each one that I quilt carefully. There are 2 layers of batting - wanted to maximize the texture. It is truly gorgeous in person. I just hope the photos convey this. It is so nice to just "quilt"...no deadline, no judge, no jury, AKA no cares!! Have a look at this gorgeous hand croched lace?...I'm no "frilly" gal, and I hate the itchy kind of lace with the best of them, but this is beautiful. I will end with one of the very few selfies I have taken. It's in front of my 2nd place winning quilt The Jester's Folly, at Paducah. If my mother could take a clear photo, I wouldn't have to resort to selfies!! 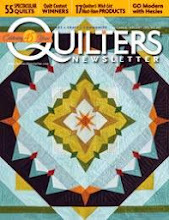 For those curious, I am doing client quilts, and I especially welcome the simpler quilts. I am coming up on summer when the custom quilting will go on hiatus. If you have something you'd like to be quilted with an edge to edge, please contact me. It is the Sunday morning following the close of MQX, and I am one tired puppy! I drove to NH on Wed, taught 3 classes, saw the show, drove home Friday, and turned around yesterday and did it all over again with my daughter. I need this next week to recuperate before Paducah! I did 3 classes - all 4-hr hand's on. I got the absolute best room of Handi-Quilter machines. I know we are not supposed to share any favoritism, but seriously, I LOVE my HQ, and having each student on their own machine, with the ability to advance their project at their own rate is priceless. I had my projects all printed at Spoonflower. They were printed in colors, and had quilting lines marked so that I did not have to do this myself! Students loved these projects, and raved about them. Good choice Me! This is my Templates...Ruler the Roost will be offered in TWO sections at MQX Midwest in October -- it is that popular. It is also at Quilt Odyseey for the 22 lucky ones who have already signed up (all sold out!). I may need to simplify that class's project though because they double up on the longarms. 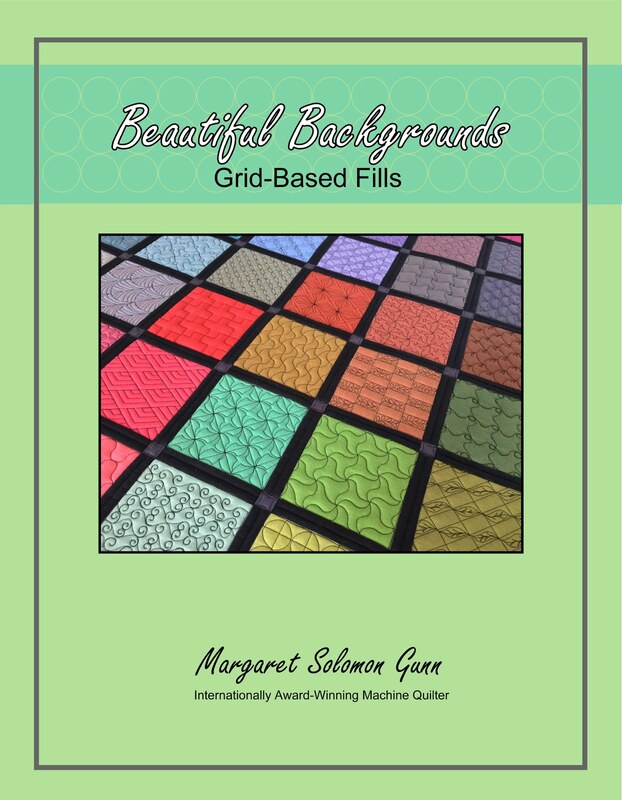 Here's the back of the project for my Beautiful Backgrounds - Grid Based fills, also being taught in 2 sections at MQX Midwest. It was a good class too. This was the first time I taught this, and will do a little "tweaking" before the next one. That is to be expected. Grids...the frontside. Love this sampler! 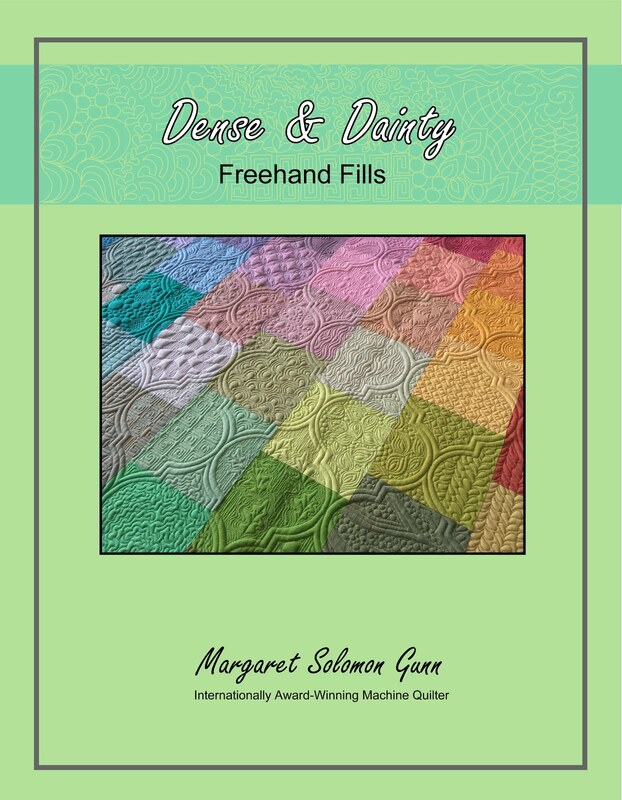 The Dense & Dainty class did as many freehanded fillers as could be quilted in 4 hours. The intent is small, so the sample is not huge. Each machine has a laminated sheet of a dozen designs (there are about 100+ different designs in the room) and students get to rotate these sheets around. They are there to create ideas, and I go around the room assisting on how to stitch ones they ask about. There is just no way I can give a lecture of instructions for all of them, and this lets them pick and choose. Some are quite intuitive, while others need a little explaining of what to quilt first. I found these "cheat sheets" to be very useful, and students were able to photograph them if they chose. I designed this fabric and had it printed at Spoonflower to compliment the sample I made for the class, shown below. The sample is actually Shot Cottons, but I loved the arabesque shape, and hoped others would find the variation from a plain black fabric interesting too. I think I might change it up to be a deeper gray, as it shows the thread a little better. On to the show!...My daughter Sophie, who is 9 had a quilt here too. Her category had 8 kids in it. This was her first completely free-handed from the front-side quilt. Last yrs was free-handed but it was largely done using channel locks. I really didn't know how she'd do among the other kid competitors. Much to her joy and my surprise, she took the first place prize!! To her, the best part was getting another sign like this one for her room, but the win did come with either a sewing machine or $100 (she took the moolah!). She's already on her way to spending it on more fabric for her next project. I'll show you my quilts and then the other quilts in the wholecloth category. This is "Illuminations", my quilt that came from the Playing in the Swamp broken lonestar. As I mentioned last time, it was mostly pieced 4 years ago, and left to die in a box. Fortunately it only went into hibernation. I still don't feel the total love for it that I do for some of my silk quilts, but I am glad it is done. The fact that I never completely loved it is probably why I was so completely shocked when it won 1st place. I could have entered this in Solo or Large Wall category. Solo had at least 3-4 very good quilts, while Lg wall had about 35 quilts in the category!...take your pick - be with the big name quilters or be with twice as many quilts??! As it happened I was in the large category, and it still fared well. In fact, this quilt earned as many points for the machine quilting as my next one did (and it won an additional award for the quilting!). It was hanging in a nicely lit spot with both great overhead light and a skylight. The quilting on the dark blue fabric showed well. 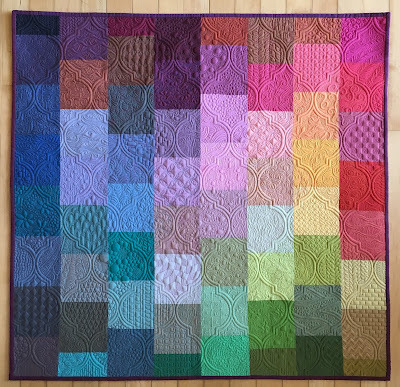 Though this quilt is largely about the colorburst and placement of color, I also need the quilting to be there because I enter in machine quilting shows. This is my Ode to Spring, which I have showed a few photos of previously. I have always believed that this would do well, despite the few bloopers I know that it has. It's start this year at R2CA and MAQF left me wondering, but this show gave me some confidence. I trust the NQA certified judges that MQX hires. I know that they weigh all aspects of the quilt (overall appearance, complexity, and technical components) appropriately when a winner is chosen. 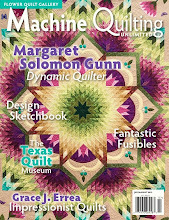 I was most pleased to get the 1st place, and seriously delighted to get the Best Machine Quilting. This is the 3rd year in a row to win that award. Here are a few photos I took...It was so much fun getting to talk to the many quilters there about the designs I chose, and the funky edging I did, and other aspects of the quilt. the center...just a touch of metallic. I don't love the stuff enough to use more! Filled Ginko clamshells are always a favorite. And that herringbone too, but maybe not so much a favorite of the students in my grids class!! It is challenging to stitch. just a tiny spider web. It is about spring, after all. Heaven forbid, no spiders though! The raying matchstick herringbone filler looked great too. I love how the many fills take on a different appearance with the slightly different thread colors used. This is just one of the great features of silk, and how the light plays off of the silk fabric. Hopefully you can see how I have gotten hooked on silk fabric! There were 6 whole cloth quilts in this category. I'm going to show snippets of all because there is nothing like a whole cloth to show off the quilting! This next one was quilted on a domestic machine (yes it is large!). It won the 3rd in the category and best machine with a sit-down style machine. It came from Australia, which may explain the wrinkling. Some of the quilts needed a day or two to hang out the creases. Even my silk quilt looked much better by day 2. Rachelle Dennenny's A Touch of Blue has trapunto, with a subtle amount of blue stitching. This is Juanita's Pearl by Sue Hawkes. It is also a very large quilt - bed sized. It won the 2nd. Incidentally, this was a 2014 NQA Masterpiece Quilt, as decided by 5 very good judges! It is rather daunting when you know you have a Masterpiece quilt in your category...sort of diminishes your confidence! I feel pretty great now though. This quilt is also trapuntoed...must have been done at least twice because there is pink and green for the roses. Someday I will get brave enough to try trapunto (one and only time I did try, I clipped part of my top!). Here is the center - very pretty and elegant. This is Wickedly Green by Deborah Poole. At about 4' square, it is a managable size! The color is more indicative of the 2nd photo too. It's a satin or silk, so the lighting plays with the true color. Another non-ribbon winner is Imperial Majesty by Donna James. Smaller yet, this is dupioni silk. It too refuses to be photographed with true color (room lighting is low). It is more of a deep blue. Not sure why it appears almost purple at times. 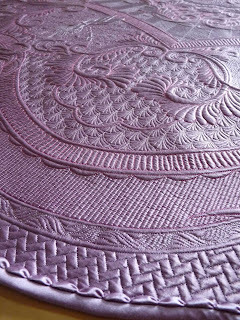 It received some coloring afterwards to fix a dye mishap where there was bleeding during blocking, so the motifs look different in color than the background. The last wholecloth is by Gina Boone. One of Gina's other quilts received my Teacher's ribbon. This quilt has some pretty features. She's learned this beaded piping. That has to be tough to make the beads take the sharper points of a scalloped binding though, but it is a great finish. I will leave you with a snippet of the center of the Best of Show by Molly McNally Hamilton. This quilt is large, and I'm not sure I have one of the entire quilt. It is so much me in the color and design. I just love her orange flowers and apple green (border). The quilt is truly lovely. I know, I know...the blog has been neglected. It has been 3 weeks since the last meager post. It is not that I don't have a few things I could post, but I have just "not been in the mood", said in the words of mt eldest son. Truth be told, issues on the homefront have left me uninspired and lazy. I know I need to motivate, but it is not easy. Here is a client quilt that just went home today. It has a wool batt and is quilted with mostly YLI polished poly thread. She did a nice job of leaving open spaces for quilting. This is a double edged sword though -- large open spaces are pretty for doing creative designing, but usually the client's budget does not support the time required. 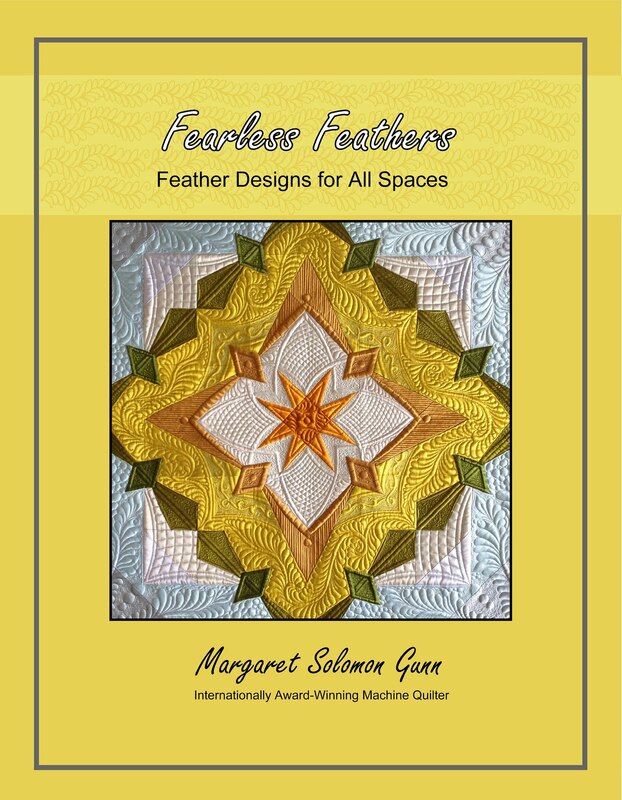 Times like this I have a few things I can quilt quickly, like feathers and fills. It is pretty, and she was happy when she picked it up this morning. The last couple weeks have been all about getting ready to go to MQX. I thought I was ready, but have managed to find the need to quilt off a couple more samples. This is part of one done for my grid-based fillers. I love to do the Sashiko fills, and realized that my samples lean towards those. I wanted to have something else that shows some fills that are of another flavor. 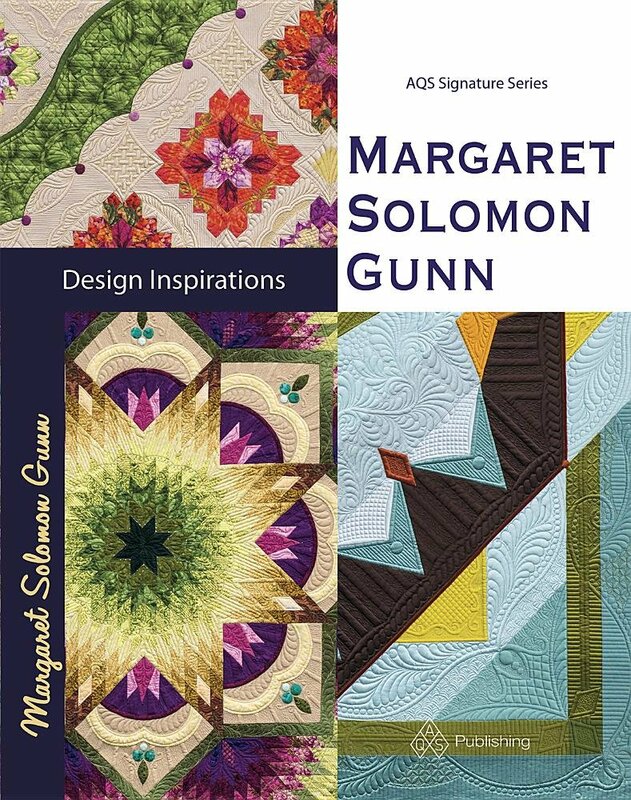 I will be teaching this class again at MQX Midwest in September, as well as Quilt Odyssey in July. I am leaving in 2 days for MQX in NH. I have 2 quilts there -- my new purple wholecloth as well as one I started 4 years ago and opted to finish this year. Neither are expected by me to be "big hitters". In fact, I will be surprised if the carpenter's star even ribbons. It's kind of mundane IMHO, and I sense that this category has some really good quilts. The quilt has moments of greatness, with points of "eh, not so greatness!". That's the way it goes. I know that my skills and my style have evolved over the last 4 years. This does not directly reflect my favorite look. None the less, it is better to finish it than to sell it off for a couple hundred dollars. What better quilt to try out a new binding on than one you consider an experiment anyways?! I did a double-piped scalloped binding. It actually turned out pretty good I think. I'll scrounge up the points wherever they are available. Ode to Spring is my other quilt at MQX. It was at Mid Atlantic last, earning a 3rd (bested by one of my other quilt, and another whole cloth). I wondered if it would received comments about the painted dragon flies there, as it did at Road to CA, but it did not. That's a good thing, as I like these. This must be the year of the dragonfly since they are on both of my quilts. That may be a dead give-away if a judge at MQX caught that they are identical, just different sizes! 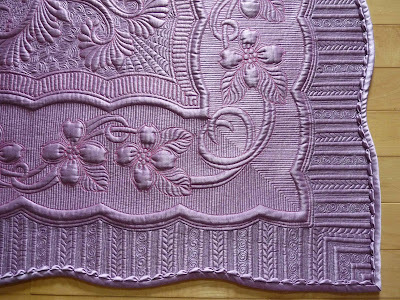 I love this lavendar (the color on the next photo is just not right) whole cloth. I think the design is intricate and clever. I had issues with the backing that I fully expect to bite me on the backside. Maybe I shoulda named it "Best viewed from the front". Here are some other detail shots. I don't think I have shared these here. 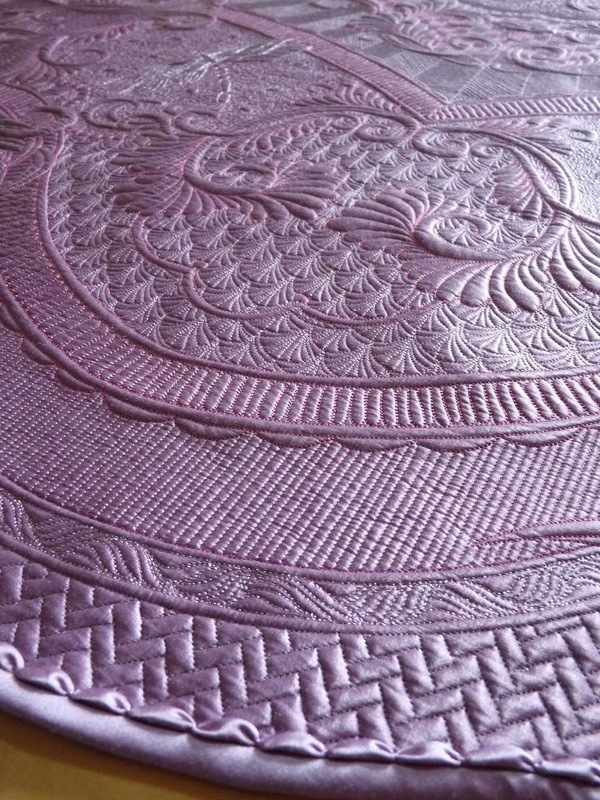 It is quilted with pink Glide thread and several shades of silk for the dense fillers. Again, seeking the creativity points for my binding...A plain straight binding is not enough. Ok, that is boring!!! It was immensely time consuming to hand ruche the trim, but it gives it an interesting finish. Again, we'll see what the MQX judges think of this one. There are a couple other whole cloth quilts in this category that I know are well done, so again, we'll see how Ode to Spring fares. My hand-pieced hexagon project is coming along. It's not like I need a new project just yet, but I am not so good at just finishing things before moving on either. The hexies are 3" on a side, so there will be less piecing, and more creative fabric cutting on this one. Block #2 is all cut out and ready to take on my Paducah trip in 2 weeks. There should be ample airport, bus and sitting time to make some headway. FYI - these blocks are loosely based on the book by Katja Marek (Milliefore). 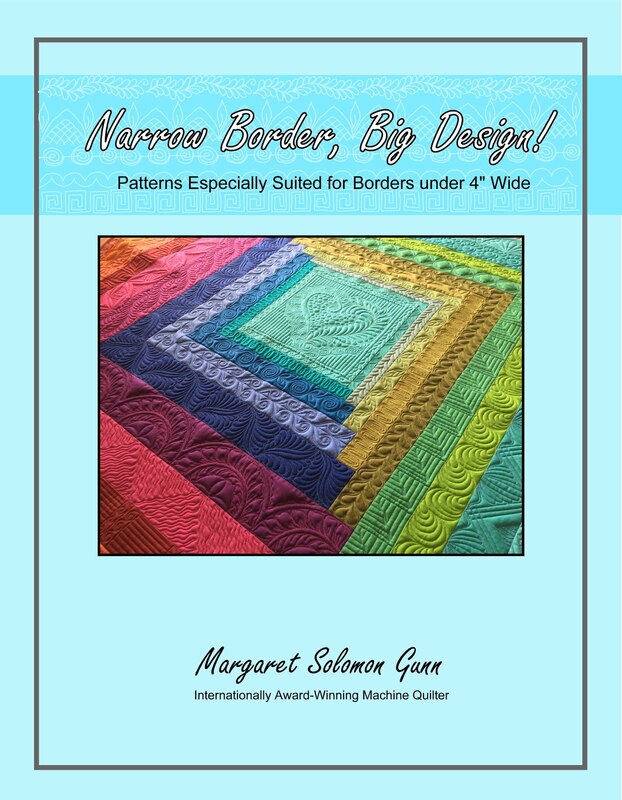 I have used a couple of her patterns, but this will not be a Milliefore, as those are way too popular, and I need my quilts to have my own flair. Off to get ready for me trip. If you are also going to MQX in Manchester this week, stop in and say hi!